Congratulations, graduates! You will soon be part of the AU alumni family. You've worked hard and we're looking forward to celebrating your accomplishments at Commencement 2019. Potential undergraduate degree candidates: If you have not yet received a degree check, please contact the Crouse Center at 630-844-6870. To complete your degree and receive a diploma, whether or not you plan to participate in the ceremony, you must complete the Graduation Application. 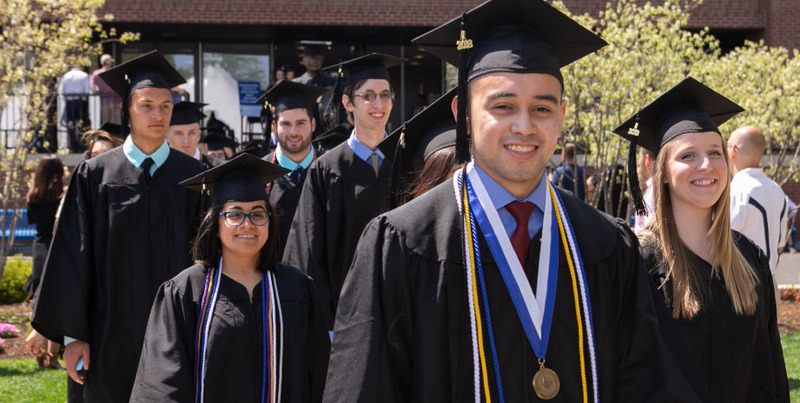 If you do not complete the Graduation Application by the deadline, please contact the Registar's Office at registrar@aurora.edu with Graduation in the subject line or call 630-844-5462. You will not be able to participate in the ceremony if you do not order an Aurora University cap and gown. If you have questions, please contact commencement@aurora.edu or call 630-844-5410. You can find graduation honors requirements here. Honors will be based on the cumulative GPA and semester hours completed as of March 15 preceding commencement and updated upon degree notation. Please take a few minutes to complete the brief survey. This survey will help AU better serve students and alumni in their career-planning activities and is an important step in completing your graduation requirements. You must complete the graduation survey before picking up your cap and gown. Pick up commencement packet. Packet will include specifics for your commencement ceremony and tickets for your guests. Recipients of the Gold Ivy Leaf and university awards will be recognized. Recipients and their families will be invited to attend. Visit our Safety and Security page for futher day-of details. Woodstock Center and Online students can select to participate in either the GWC campus ceremony on Saturday, May 4, 2019, or the Aurora campus ceremony on Sunday, May 5, 2019. A professional photographer will take each graduate's photo as he/she receives his/her diploma. The graduate will receive a proof of the photos via email after the ceremony and will be able to order prints. For more information, visit MyGradPic. Cameras are permitted, but guests are asked to remain in their seats during the ceremony. The ceremony is videotaped and streamed live at aurora.edu/commencement; the video will be available for replay afterward. Fresh flowers are available for purchase before and after the ceremony. In the event that severe weather occurs during the ceremony, the President will immediately conclude the event. Campus Public Safety officers and university staff will direct attendees to designated areas of shelter. The ceremony will not be resumed; degree candidates may go directly to Thornton Gymnasium for graduation photographs.